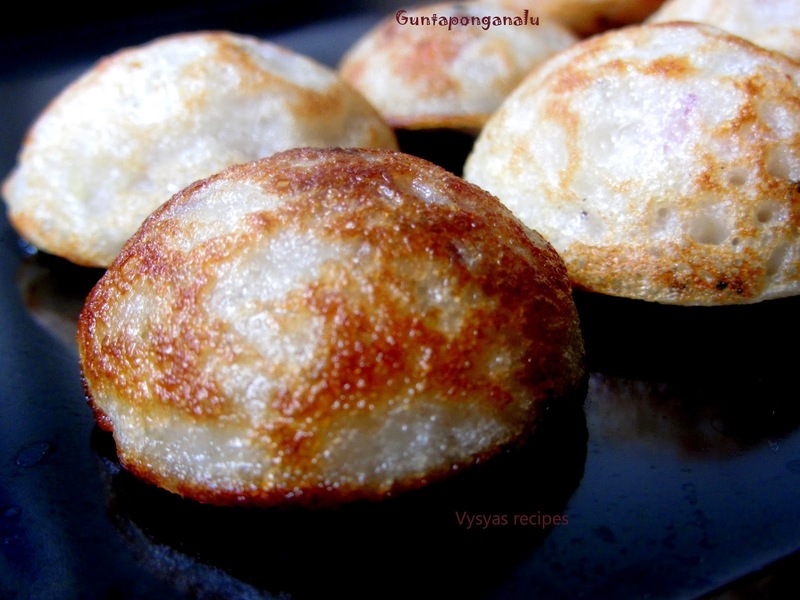 Gunta ponganalu is one of the south Indian recipe. From bigger Restaurants to the smaller ones,everywhere they sell paniyaram.Kuzhi paniyaram is known by various names in Southern India, including paddu, appe, guliappa, gulittu, gundponglu, ponganalu, and gunta pongadalu.It Increases the business of all the Restaurants. It can also be taken as an evening snack.From the older to younger everyone likes paniyaram.Now we learn how to make Gunta ponganalu with left over rice. Cooked Rice - 1 cup. Fenugreek seeds - 2 tsp. Channa Dal - 2 tbsp. oil - for fry, for toasting. Soak Raw rice and fenugreek seeds together for 4 to 5 hrs or overnight. Grind Raw Rice,Fenugreek,Cooked Rice,green chillies, salt together with needed water in a blender or mixie into a fine batter. Allow the batter to ferment for over night or 12 hrs (like we ferment idli batter). Heat the oil add mustard seeds let it crackle, then add channa Dal,urad dal saute well, when it turns golden brown add onion(finely chopped)curry leaves, saute for few minutes.Now switch off the stove. Now add the sauted content to the fermented batter and stir well. (consistency should be thick like idli batter).Now Gunta ponganalu batter is ready. 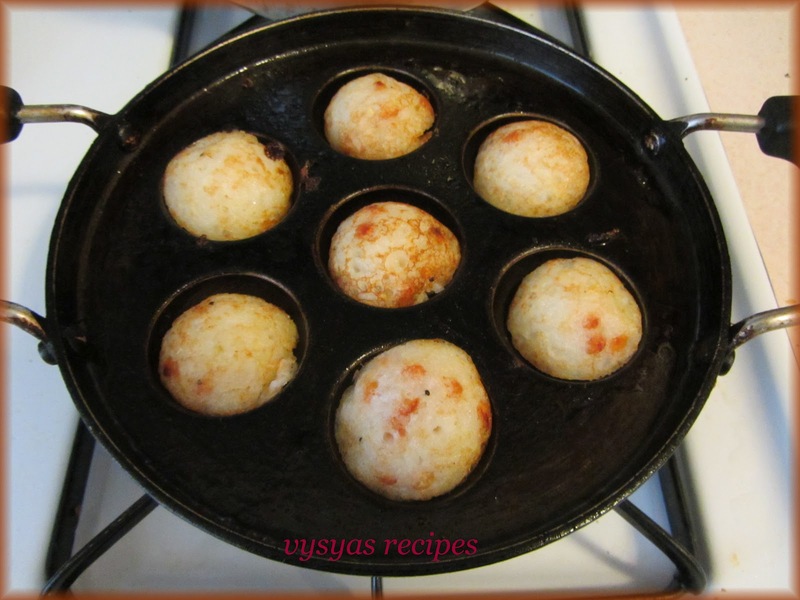 Heat a paniyaram pan, when it is hot, add 1/4 tsp oil in each hole of a pan.Then take a ladle of batter and pour it on each hole. 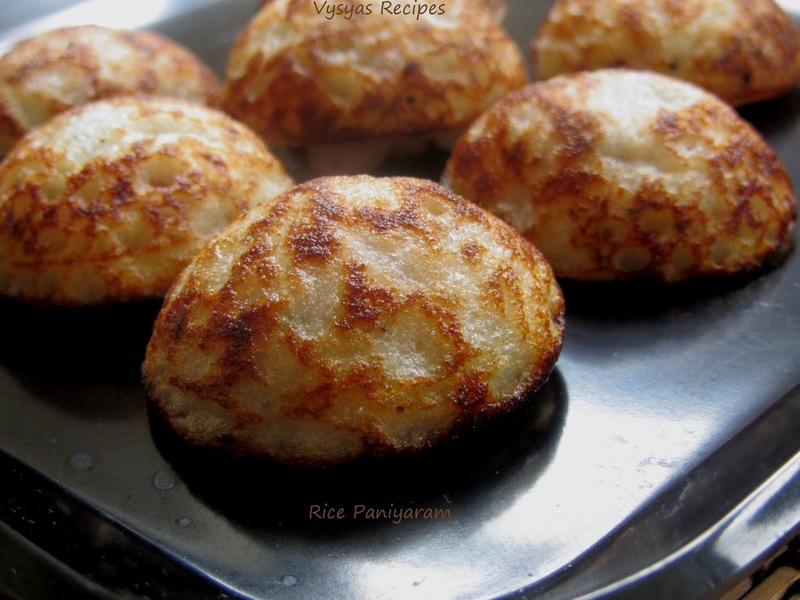 When you get holes in a paniyaram(gunta ponganalu) , it got cooked, so now you can flip a paniyaram, when it turns golden brown, and both sides are cooked ,remove it from a paniyaram pan. (To flip you can also use spoon or knife or paniyaram stick). It serves very well with coconut chutney and idli milagai podi.